Daniel Berrocal is understandably no fan of the blockbuster movie, Jaws. Berrocal is with Dive Costa Rica Islands, which sends people on 10-day shipborne packages to Costa Rica’s Cocos Island, where they’ll spend a week diving with rays, whales, dolphins and schools of fish. “It’s really known for its biodiversity,” Berrocal’s colleague Onditz Caparsoro says of the waters surrounding the island, found in a national park. 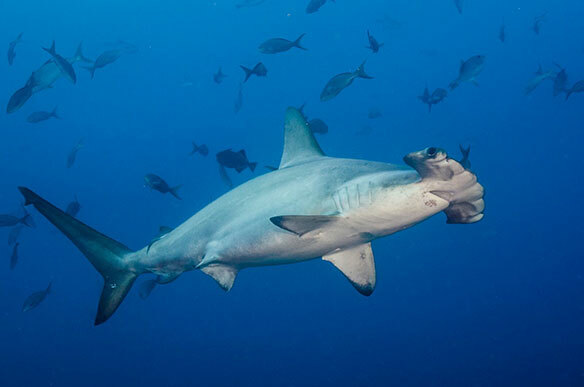 Among sharks that inhabit those waters are hammerheads, white-tip and Galapagos. Berrocal says divers shouldn’t be nervous about sharing the waters with sharks. Dive Costa Rica Islands clients are given a briefing before taking to the water on how to interact around the predators. Divers can generally expect to reach depths of 80 to 100 feet. It’s recommended that clients have advanced diving certification. Participants can go on three dives a day. Cocos Island lies over 500 km off Costa Rica’s Pacific coast, and the trip to it from the mainland takes a day and a half, as does the trip back when the diving concludes. Berrocal – who jokes that Jaws was “bad for business” – says divers will end their underwater exploration upbeat after viewing large amounts of marine life and unscathed as well, despite being in ocean water that’s home to creatures not all people are comfortable being around.